Past Week of Storms: Lots of Rain, Just a Little Damage, Cachuma Rising! Rainfall over the past week in Santa Barbara County put Montecito to the test (it passed! ), caused closures to Hwy 101 for a day while muddy runoff was removed in several areas, closed Hwy 154 due to mud on the highway near Lake Cachuma, and caused local flooding and stranded vehicles in Santa Barbara and elsewhere. Saturday morning was particularly exciting, and I happened to be driving in the neighborhood on some errands when the an inch of rain came down in 15 minutes; pretty exhilarating, even at a 5mp crawl in my car. Lake Cachuma’s level is on the rise, about 40 feet from spilling level, and this morning it measures 48.7% capacity. 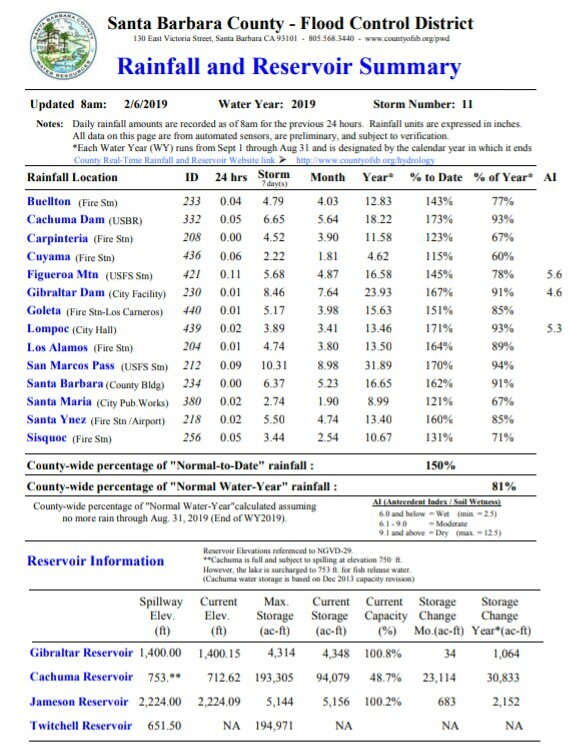 Runoff is going to continue adding to the lake this week whether it rains or not, and we have another week of unsettled weather ahead (next week)… so things look good for Cachuma this year. It would take an incredible amount of rain to fill the lake and I doubt that would happen; still it looks like we are on track to getting lake level to over 50%. Meanwhile, our smaller reservoirs – Gibraltar and Jameson — are 100% full and spilling. The last 7 day storm cycle brought about 6.4 inches of rain to Santa Barbara and 10.3 inches to San Marcos Pass. Each of those areas is measuring over 90% of the annual rainfall total already for the “water year” of September through August, so we have more than 6 months to go to get to an average amount for an entire year. Although the next series of storms looks to be lighter than what we just had, we will probably reach the average annual rainfall totals fairly soon, and the rest is icing on the cake until next September. Drive safe, stay warm – it’s a cold week! Next Sue’s News will be January real estate sales information!